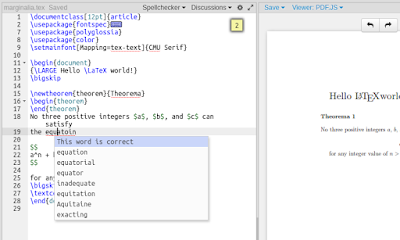 We have added spelling corrections and project dictionaries to our spell-checker. 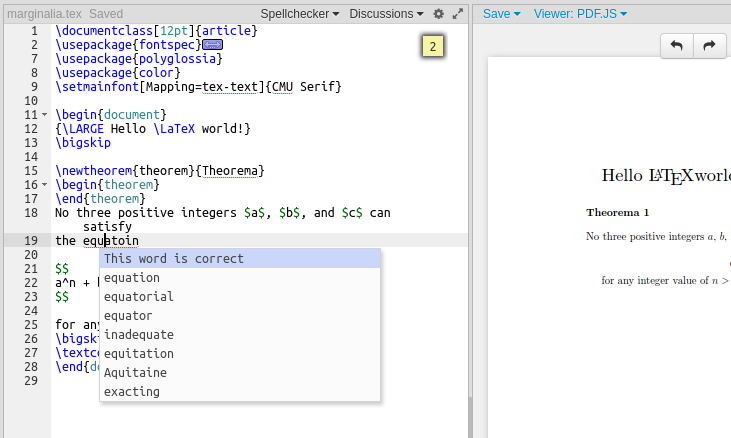 Now if you position cursor on a highlighted word and hit Alt+Enter , you will get a list of corrections. 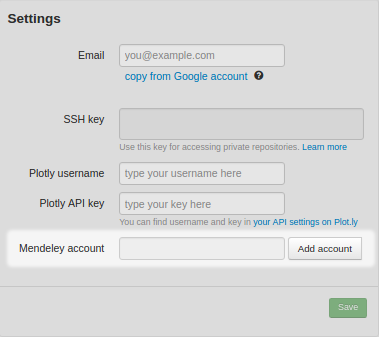 Besides, if some word is not known to spell-checker, you can add it to whitelist. Vice-versa, if you see that some word is not highlighted as spelling error, you can add it to blacklist. Both whitelist and blacklist dictionaries are defined on the project level and are available to all collaborators in a single project. 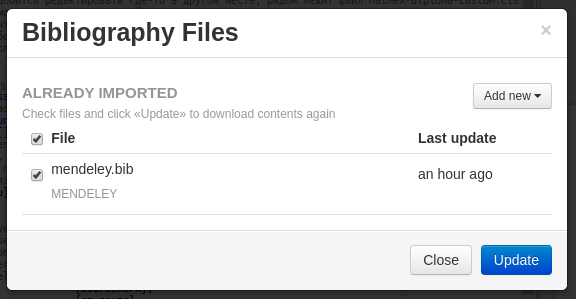 Now you don't have to click "Compile" or hit Ctrl+F9 that often. Compile your project the first time, and Auto-Compiler will continue compiling it for you. In the user interface Auto-Compiler appears as a robot icon in Compile button. If it is black and moving back and forth then it means that someone, probably you, is typing text in the currently open project. Once typing becomes idle, the robot start compiling it. Read more in Auto-Compiler docs. 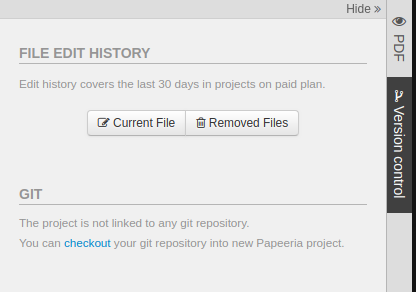 Auto-Compiling is available to all users working in paid projects. Upgrade to Delta to benefit from Auto-Compiling in all your projects. TL;DR: paid plan subscribers can now pull their bibliography from Mendeley into Papeeria project. You can now access bibliography files in the new Biblio pane. 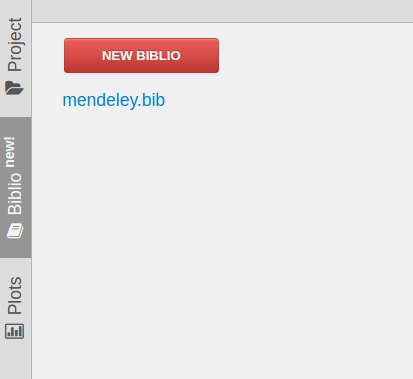 It shows a filtered project tree with only bib files and provides a Big Red Button to create or import new bibliography. 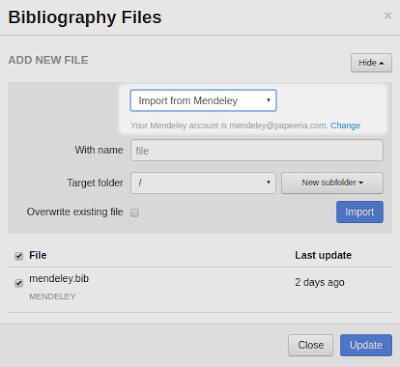 Import references from Mendeley into Papeeria using New Biblio button in the Biblio pane. Currently we pull all available references and write them all into one BibTeX file. LuaTeX is a TeX compiler which is capable of running Lua scripts in TeX documents. It might be handy in some use cases, e.g. for automated layout of trees or for building plots. Check out this project to see a couple of examples. You can choose LuaLaTeX engine in the project settings or in the Compile dropdown. It is supported in both TeXLive 2015 and TeXLive 2016 distros. We have made autocomplete less obtrusive and fixed a few bugs. We also significantly improved typing Japanese using standard input methods in Microsoft Windows and Mac OSX.